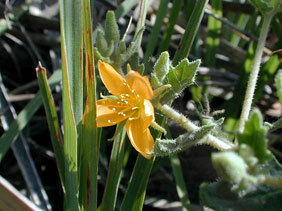 Stems: Ascending to erect, 1 to several, much-branched, whitish, rough, brittle. Leaves: Alternate, simple, sessile, ovate to rhombic, .5 to 2.5 inches long, 1/4 to 1 inch wide, rough-hairy; margins coarsely toothed to basally lobed; tips blunt or pointed. Inflorescences: 1- to few-flowered, in leaf axils near branch tips. Flowers: 1/2 to 3/4 inch wide; sepals 5, lanceolate, tapering to very slender points; petals 5, yellow to orange; tips pointed; stamens 15-40, about as long as petals. Fruits: Capsules, cylindric to club-shaped, to 1/2 inch long, slightly curved; seeds 1-4, oblong, not sharply angular. Habitat: Dry rocky sites, particularly limestone and gypsum hillsides, ledges and bluffs. Distribution: Throughout, but more frequently in east of Kansas. Comments: Hooked hairs on the leaves allow them to cling tightly to clothing or fur. Entwined in sheep's wool, the leaves can lower the wool's market value.